One of the best things about Appleâ? 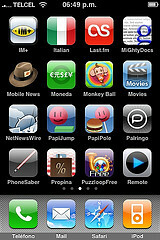 ?s iPhone is that it can keep you busy in a variety of ways. This is largely thanks to the number of great apps that can be downloaded from the iTunes App Store, which is now home to more than 850,000 apps. One of the top categories of these tools that you can get is productivity, which can help you in both your professional and personal or everyday life. Here are the five must have iPhone productivity apps. Dropbox is a free app that allows you to store all of your content from documents, photos and videos in one convenient spot. It is essentially a cloud service that provides you with 2GB of space for free simply by signing up on Dropbox.com. A great perk of this app is that once you have stored photos and video on your account, you will automatically receive an additional 3GB of storage. Access your files from your iPhone and other devices, such as your computer or tablet. Evernote is a free app that can increase your productivity even when you are out and on the go. With it, you can create notes, capture photos, make to do lists, record voice notes and much more. All of your notes can be accessed through your iPhone and other devices, no matter where you are. It is an essential app for individuals in business and students as they can quickly and easily capture photos of text they need or record voice notes such as a meeting or lecture for future reference. PocketLife Calendar is free and is an easy to use calendar app that has a beautiful user interface. It is similar to the built in calendar app on the iPhone but is even better due to its appearance and the additional features that are built within. Display all of your calendars, create custom events, view it in daily, weekly or monthly view, add a passcode to protect it, create personalized colors within it and much more. You can even export your calendarâ? ?s data to Outlook, Gmail or iCloud. Translate Voice Free is a wonderful app for any individual who has to travel internationally on a regular basis. Especially useful for those who frequent countries that have languages other than their own, users will enjoy this app as it can easily and flawlessly translate speech in a variety of different languages to English so that the speech can be understood. It works in over 100 countries with as many or more different languages. You can even use it to text with someone in another language simply by speaking your phrase to have it translated. From there, you can copy and paste the results. LockBox is a free app that allows you to store all of your sensitive information, such as bank or credit card information, passwords, pin numbers and more in your iPhone. Everything stored within is protected and kept secret thanks to a code only you have know. All of these productivity apps can enrich your life in some way. It is worth investing the time to download them to your iPhone. You will find that you will feel more organized in your daily life. Eric is host of the blogÂ best android appÂ which identifies the most popular, most successful apps available.